Apple scab or black spot is caused by the fungus Venturia inaequalis. 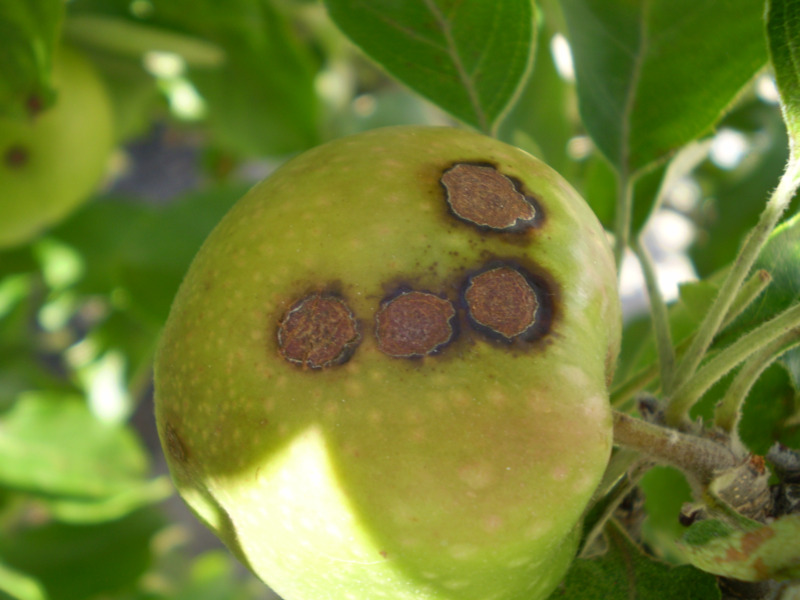 Apple scab is a relatively new disease for Western Australia that can have a significant impact on apple production if not managed appropriately. This article provides details on symptoms, life cycle and control under Western Australian conditions. Apple scab or black spot is caused by the fungus Venturia inaequalis (Cooke) Wint. This disease can infect the aerial parts of apple trees including leaves, petioles, flowers, fruits, pedicels, young shoots and bud scales. It is favoured by cool, rainy and humid spring and summer conditions. If left uncontrolled it can cause significant crop losses. Leaves and fruits are highly susceptible to apple scab in their early stages of development. Apple scab appears as black spots on either the upper or the lower leaf surface. Young scab spots appear as light green areas, which contrast slightly with the healthy surface (Figure 1). As they develop, lesions turn olive-green to grey with a velvety surface and a more defined outline. Older spots appear deep black and may be slightly raised giving the leaves a blistered appearance (Figure 2). Leaf infections late in the season can be seen as dark grey, angular spots on the underside of the leaves (Figure 3). Severe infections can cause leaf drop and tree defoliation. Black patches can develop on flower stalks, ultimately causing the flowers to shrivel and die. Lesions appear on young fruit soon after fruit set and resemble those on leaves. However, they enlarge more slowly, become darker and are more sharply bordered. As the spots enlarge, the central area becomes black and corky, resulting in a severely scabbed appearance. The surrounding border of the lesions appears as a greyish-white band of loosened skin (Figure 4). As the growth of tissue in the infected area is reduced, the fruit becomes badly distorted. Early season infections are often associated with the blossom end of the fruit. Later infections can occur anywhere on the fruit surface. Infections on fruit nearing maturity result in small spots with little distortion. Infections just before harvest may not be noticed during picking but can develop later resulting in storage scab.